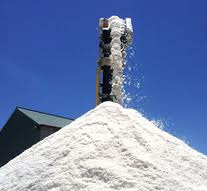 Sodium chloride commonly known as ‘ common salt ‘ is a basic raw material for the production of a wide range of chemicals including Caustic soda and Soda ash. 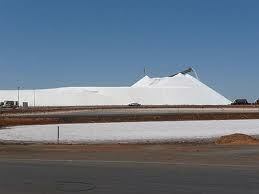 The cost of salt has been recently increasing steadily due to wide demand and supply gap all over the world. This in turn has increased the cost of all other chemicals derived from salt and this situation is expected to continue in future. Salt industry has been traditionally using a ‘solar evaporation’, an age old technique from antiquity. The technology involves pumping of seawater on large area of arid land and allowed to evaporate as the concentration of salt increases. The brine then passes on through the various ponds, with the sodium chloride content rising from 2% to 25%. This increasing salinity gives the ponds a distinctive pink color, as algae in strongly saline solutions produce a red pigment called haematochrome. The Red Sea is red for the same reason. The saturated brine is pumped to smaller ponds where nature continues its work of evaporation. Once the volume has been reduced to 10.2% of the original, any further concentration results in the deposition of sodium chloride. From September to February more brine is added until at least 25 mm of salt has settled and it is time for harvesting. The brine remaining (called "bitterns") is a saturated solution of NaCl, with the other salts present at concentrations well below saturation. This is pumped out to sea just before the harvest is gathered, as these ions would contaminate the salt if all the water were evaporated off. For four to six weeks beginning in early March, mechanical harvesters scoop up the crystallized salt and load it on to trucks that shuttle back and forth across the ponds to the washer. In the two washing plants the salt is washed in clean saturated brine, in which the other salts, present as impurities, dissolve. From there hundreds of tones of clean washed salt are discharged daily on to the stacks for storage - up to 10,000 tons per day. During winter no more salt is recovered, but the plant continues its regular work of processing and beggaring the stockpiled salt. But this raw salt has number of impurities such as Calcium, Magnesium and Sulfate ions which are harmful for the production of further chemicals. Though the cost of producing salt is cheaper by solar evaporation, the cost of purifying salt from above impurities and making suitable brine for chemical production is expensive .The cost of salt used in chemical processing industries after transportation and purification increase to whopping $ 200 and above. Many Asian countries such as Japan, South Korea, China, Taiwan and Indonesia are major importers of salt. The salt import by the above importers in Asia pacific region between 2000 and 2009 has increased by 6 million tonnes, equal to 40% or 4.6% per annum.In four years between 2005 and 2009, the price of salt increased by US$25/Mt, equal to 83% or 16% per annum.The average price of imported salt varies between US$40 to $47/Mt. (Ref: Salt partners). Erratic weather patterns, sea level rise, Tsunami, inundation, flooding and unseasonal rains have hampered salt production all over the world. The chemical industries are facing an uncertain future and unpredictable pricing of salt. Prolonged winter in Europe and US and other parts of the world have pushed the demand for salt for de-icing. India is the third largest and cheapest producer of salt in the world with lowest labor cost. But even in India, the prices of salt have gone up recently from Rs.600 to Rs.1000/Mt. An Australian company has developed and patented an innovative technology to solve the above problems. The company uses membrane technology to produce Sodium chloride brine directly from seawater suitable for all chemical products in the downstream. This novel technology separates seawater into salt and drinking water, after all seawater contains about 95% pure water. It can solve the problems of many mining companies in Australia who need Caustic soda as well as water for their processing. The following is my evolved analysis with the strategy: The key consideration for evaluating five cent's plan is just how much you earn payday loans some lenders require one to fax in documents but others don't.